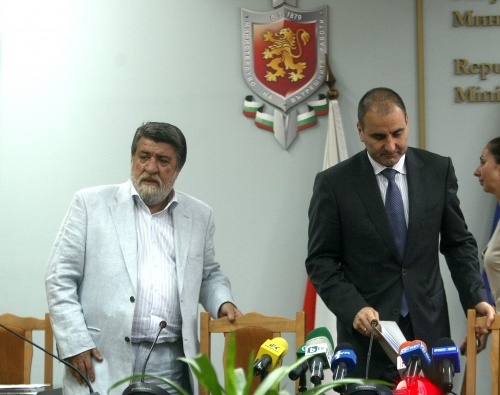 Bulgarian minister of culture Vezhdi Rashidov (L) and interior minister Tsvetan Tsvetanov (R) at a press-conference Thursday regarding the security and protection of cultural and historic sites. Photo by BGNES. Bulgarian police officers will continue to protect the Shipka Memorial, the National Museum of History, the National Learning Complex of Culture and the National Art Gallery until the end of the year. The decision has been made at a meeting Thursday between the Interior Minister Tsvetan Tsvetanov and the Minister of Culture, Vezhdi Rashidov. The four historical places have almost been left unprotected because they were left out of the police list with national places with strategic importance. The ministers have decided that municipalities could take over the management of some of the historical places. There is also the possibility for giving them for a concession. Rashidov has stated that at this point the Culture Ministry could not ensure the guarding of the monuments due to the cuts in the cuts of the state budget. However, he expressed his hope that next year “things will get better”. Russia has also expressed concern about the possibility of removing of the guards at the Shipka Memorial. “The Russian Embassy would like to remind the Bulgarian authorities their obligations for preserving the monuments, connected to the history of both our nations,” said the letter from the Russian Embassy in Bulgaria. The Shipka Memorial was built in 1934 in honor of those who died for the Liberation of Bulgaria during the battles of Shipka Pass in the Russo-Turkish War of 1877-78.